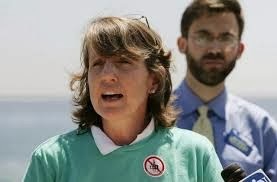 On this Thanksgiving Day episode of EnviroPolitics Podcast,we interview Cindy Zipf, executive director of Clean Ocean Action. Cindy reflects on the battle her group led 20 year ago to stop ocean dumping off the New Jersey coast. She explains how her coalition has been pushing for national legislation to protect one of the nation's remaining un-industrialized ocean areas and she details their present-day fight to stop Port Ambrose a liquefied natural gas (LNG) facility proposed by Liberty Natural Gas off the coasts of New Jersey and New York. Our conversation wraps up with a discussion of how Clean Ocean Action contributed, in award-winning fashion, to numerous cleanups in shore communities following Superstorm Sandy--and what lies ahead. We think you'll really like the show and you may learn a good deal, too. Want to help us grow the podcast? We'd be most grateful if you'd take a few minutes to give us a review on iTunes and Stitcher. You review will help us reach more listeners and encourage experts to participate in future interviews. Thanks in advance. For more information like this, try a FREE, 30-day subscription to EnviroPolitics. Will Lambertville follow neighbor on organics recycling?